this was pretty raw today so I don't feel like making joke tags. It was a fetch quest. I trekked across the Cordon, rifle in hand, teeth clenched. I was still new to The Zone, woefully underequipped and afraid of everything. An encounter with my first anomaly earlier had seen to that. Still, I needed the money, and I was fairly certain I could make it to my destination and back without much incident. When I got there, some weird dogthing stood in my way. No matter, it was just one dogthing, and I was a guy with a gun. That’s when it started cloning itself all over the place. The invincibility of youth is not easily destroyed. Looking back on my teenaged self, I’m actually somewhat envious. Where before, I’d had to rely on the strong arms of my father to provide for me, I began to find that I was more independent. I was stronger, faster, smarter. Better. There was nothing I could not do and no goal I wouldn't work hard to accomplish—the world was mine. This is all exaggerated, of course, but at the time, I didn’t feel that way. I was invincible, then, and nothing could crush me. Then it all started to slip away. There was a time when I slept eighteen hours a day and spent what few waking hours I had trying my best not to vomit. A veteran, specialist doctor of an elite research hospital would later tell me that I was the sickest patient she’d ever seen. Others remarked that I was so sick I should not have been able to get out of bed, much less make it to the car, or even the appointment. My mind started deteriorating too. I had been an all-A student, liked by teachers and regularly employed by students seeking help, but my illness changed everything. Not only did it become a challenge relate to people, but I began experiencing panic attacks around them. I was later diagnosed with Social Anxiety Disorder. Everything I had been—that charismatic, likable, happy-go-lucky guy—ceased to be. I don’t say all this to complain. I say this because I know from nearly a decade of experience that my predicament can be challenging to understand. When it takes a paragraph to give someone a basic understanding of what you have, they’ll simply stop caring. In my case, family members berated me for my “laziness” even when I was living with them, hundreds of miles from home, because they lived near the only hospital I'd ever received any help from. Never mind my crippling symptoms—these people could not comprehend my illness, so they berated me for it. My illness reached its peak in 2008. Shortly before, it actually appeared that my illness was diminishing, so I transferred to a school a few hours away to pursue my dream of becoming a professional pilot. Within a month, my symptoms were back, and I was too stupid to realize their severity. I thought I could power through, but I was wrong. My body began to deteriorate more rapidly than ever before, my grades rapidly accelerated into “fail” territory, and then, for the first time in my life, I gave up. No more pills. No more school. No more trying. I left the house for food and the job that provided me food, and that was it. I could do no more. My illness had won, and I would die a slow and agonizing death. That was it. There was no more fight left in me. I played video games to pass the time. Unlike other forms of media, video games are a wonderful form of distraction because they require active participation, and I found them to be the only thing that kept me from losing it entirely. On a technical level, STALKER: Shadow of Chernobyl is, quite possibly, one of the worst games ever made. I’ve never actually been afraid to attempt saving my game before for fear it would crash. One day, I left it paused for what must have been a dozen hours because I wasn’t sure it would actually start up again. My relationship with GSC Game World’s singular immersive survival game was off to a rocky start. In addition, the high from games like Portal, Call of Duty 4, and Bioshock still hadn’t worn off, so STALKER’s low production values compared poorly. …yet, despite its shortcomings, and perhaps because of them, it saved my life. STALKER, at first glance, is cruel. It’s unfair, needlessly brutal, and willfully malicious. Other games—great games—are all of these things as well, but STALKER has one major difference: it’s alive. It’s one thing to play a very hard game, learn its patterns, and be able to unlock its secrets, and another to grind and grind and grind until challenges become annoyances, but with STALKER, things are different, because STALKER cannot be gamed. 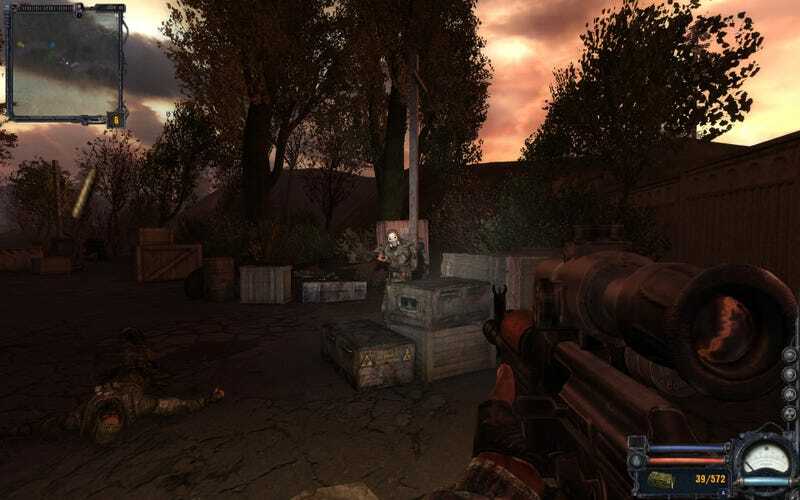 STALKER requires the player’s attention and respect, a far cry from 2007’s most popular titles. In Bioshock, death mattered little because players could simply respawn, pick right up where they left off, and accomplish whatever task they set out to accomplish with relative ease. Portal, like most Valve games, relies heavily on player conditioning, making it nigh-impossible to really ‘fail.’ Call of Duty 4: Modern Warfare ran with the idea of a heavily-scripted shooter first pioneered by Valve with their work on Half-Life. What separates STALKER—what makes it one of, if not the best games that I have ever had the pleasure of playing—is that it takes place in a living, breathing world. A stalker you meet early on in the game may be seen walking around the later areas, decked out in better gear, or he might end up as a corpse, his body torn apart by anomalies, mutants, or both. A pack of blind dogs might hunt a trio of bandits, resulting in a firefight, entirely independent of player or developer intervention. STALKER’s a simulator of a fantasy world. It’s a game that puts its players in new place and says “have at it.” My first playthrough was daunting, agonizing, and thrilling. I didn’t actually beat it my first time through, instead getting one of the bad endings, but that didn’t really matter. STALKER’s power is rooted in its ability to turn its player into someone else. That’s what saved my life. All games, by virtue of player participation, are innately engaging. The developers at Looking Glass Studios understood this and strove to take it a step further with each game they made, from Ultima Underworld to Thief II. Following their demise, the genre expanded briefly, with games like Deus Ex, and then went dark. STALKER, a weird game from an obscure Ukranian studio, was its resurrection. Through its immersive qualities, STALKER put me in the shoes of the Marked One. With its malice, STALKER put me in the mindset of someone who needed to survive. Each new obstacle became a challenge to overcome, whether it was a mercenary, a mutant, an anomaly, my illness or… yeah. By changing the way I thought about playing video games, STALKER changed the way I thought about life. By demonstrating, through my own actions, the value of survival—by providing me, a guy with no hope left, with the ability to overcome the challenges that faced me, STALKER reminded me of the person I could be. It’s not that STALKER ever grabbed me by the shoulders and shouted “THIS IS A GAME ABOUT SURVIVAL AND WHAT YOU JUST DID WAS SURVIVE SO THIS IS APPLICABLE TO REAL LIFE!” It’s not as if the first hour or two brought about some sort of rapturous transformation, because the game, as was its wont, crashed for the umpteenth time, and I left in frustration. I think I returned because I had some semblance of control there, but never an absurd amount. I had just enough power to fight for more, and as a result, I found myself motivated to come back, time and time again, to feel this sense of control. STALKER saved my life by degrees. It was in overcoming not one, but dozens of challenges that I found myself transformed, from the time I had to out think the military under the bridge in Cordon to the first encounter with the dogs at the Hundred Rads Bar to the appearance of the Poltergeists in Lab X18. It was all about surviving using wits and luck, using them to overcome these obstacles in this living, breathing world that tried its best to be real without being realistic. Each accomplishment, every small victory, it added up. By having to live in STALKER’s world, to truly inhabit it, I learned to become more adaptable. Challenges that seemed overwhelming began to become more manageable. STALKER taught me to think differently—in a lesser video game, the path presented to me would have been the only one. If I died, I would have been able to game the system, to memorize patterns or resort to guides for assistance. In STALKER, the path presented is often merely the most obvious choice, and sometimes, the most difficult one. Its dynamic world is inherently unpredictable, neutering any pre-conceived strategies and tactics players might have at their disposal. If I had not had the chance to be the Marked One, to explore that living, breathing world of The Zone, things might not have changed. But they did. STALKER presented an experience as challenging to me as what I was facing—seemingly hopeless, but always, in some way, winnable. The paradigm shift in thought it brought about infiltrated my entire thought process—the logic leaped from computer to reality. I stopped giving up, started fighting harder than I'd ever fought. That semester went poorly. I had to move home, get a job, and pay off my debts. I’ve undergone intensive, often painful medical treatment. Since then, every single day has been a struggle. I wake, my mouth tasting like cotton, my bones aching like they do when emerging from hypothermia, and I roll out of bed, steady myself, and go about my day. It's a painful, miserable existence, in nearly all respects. Not a day goes by that I don't wish my life were better. But now? Now, when I climb out of bed, I force a smile onto my face. When someone accuses me of laziness, I tolerate their lack of understanding. When it hurts to walk, I force myself to limp. I move forward, always forward, never giving in. There are times where it's next to impossible to survive the challenges presented, where I want to give up, and somehow, I hold on to make it to the next day. I’ve fought for my life harder than ever before. Without STALKER, I would never have done that. I wouldn't have made any effort. I wouldn't have wanted to. As a result, I’ve been rewarded—several doctors have told me how much they admired my tenacity, telling me that others would have given up long ago. I credit STALKER with that. Unfortunately, my life isn’t all sunshine and lollipops. I’m still sick, and that’s made it hard to find gainful employment. I returned to school to learn game design, but my department collapsed. My father, who was paying for my medical treatment (and providing me with a place to stay while I attended school), recently lost his job. Right now, I'm trying to figure out how to buy a new pair of shoes, since mine are about two years old, and the plastic's cracking and cutting into my feet. I'm worrying about how to pay the rent in January. I'm not sure if I can afford to buy more than about $20 worth of groceries each week for the next several weeks. Each day presents a new challenge. Some days, I find it almost impossible simply to get out of bed in the morning. I’m not giving up, but some days, I get close. I don’t know what to do with my life, where to go, or how to survive. When the challenges in my life get too hard to face, I hop into a video game. Instead of freezing in the face of an insurmountable challenge, I tackle something beatable and remind myself that I’m capable of overcoming whatever comes my way. Then I take that reminder and go out into the world—do my own thing. Developers, I think, are often too focused on trying to be differentby adding a new gimmick to existing mechanics or chasing after the latest popular trend. Some of them believe that a service-based, always-on, social media-driven game is the way to go. Others believe it’s all about online, XP-driven gunplay, and others still seem to think it’s about the latest variation on a platformer or MOBA theme. Often, they’re too busy worrying about whether players will immediately understand their game. They forget the power of the medium they shape. STALKER, and perhaps the medium of video games as a whole, is really just about life in a nutshell. It’s struggle, frustration, hope, heartache, joy, and thrills all wrapped into one comprehensible package. Because it functioned on a more intimate level, it caused me to think differently. In doing so, it saved my life, and that wouldn't have been possible had it had tried to be anything else. I originally wrote this as a freelance journalisty piece at the recommendation of an actual freelance journalisty guy. He talked me through it. I really like it, but I wasn't able to successfully pitch it to anyone, so here it is, on TAY. In case you couldn't tell, this is raw feels for me. You know where to find me. Tumblr, Twitter, the DocTalk tag, or #TAY on IRCHighway.